Gray's Auctioneers kick off 2011 with what promises to be a terrifically eclectic Furniture, Paintings and Decorative Arts Auction on January 25. This auction features paintings & drawings from the 17th century to the 20th century, furniture from Charles II to mid-century modern, antique rugs, runners and carpets and a number of delightful decorative lots including a collection of Chinese and Japanese bronzes and porcelains. 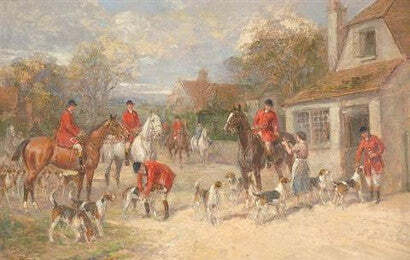 Notable lots include Lot 28, a gloriously evocative oil, A Hunting Morning by the renowned British sporting artist Heywood Hardy (1842-1933). Capturing the excitement of gathering for the meet this painting is very similar to Hardy's The First of November which sold at Christie's in London in 2010 for £34,850. Gray's has conservatively estimated lot 28 at $12,000-18,000. Meanwhile, Lot 6 is a beautiful, gilt-framed 19th century oil of 'serenissima', Venice, the city of canals, at sunrise by American/Italian artist Nicholas Briganti (1861-1944). 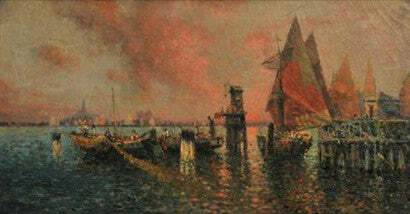 Briganti's views of Venice and its waterways are among his most venerated works of art. Clearly inspired by the city he captures the transformative light of the sunrise, bathing the lagoon and sky with a majestic glow. This stunning work of art is estimated at $2,000-4,000. The sale is taking place in Cleveland, Ohio, United States.